The Bills opened the scoring with a QB Tyrod Taylor touchdown pass to TE Charles Clay, while the Jets would make the game competitive after two Chandler Catanzaro field goals, heading to halftime, 7-6 in favor of Buffalo. A second-half TD from Taylor to WR Andre Holmes and a FB Mike Tolbert rushing touchdown were enough to overcome a QB Josh McCown rushing touchdown in the third quarter, and the Bills came away victorious, 21-12. With that, we give you our PFF exclusive takeaways from the contest for each team. Taylor avoided taking risks and played a reliable game manager role in Buffalo’s win against the Jets. The Bills quarterback’s lone interception came on a dropped pass while he was on target on 17 of his 21 aimed attempts, including on four of his five attempts traveling more than 10 yards in the air. While Incognito was not his dominant self in the run game as he had to face a stout Jets defensive line, he was still the Bills’ highest graded run blocker. Furthermore, Incognito was the only Buffalo offensive lineman who did not allow a single pressure in the Bills’ win against the Jets. Playing in his first regular season game for the Bills, the former LSU Tiger was targeted five times in coverage. He allowed just three receptions for 41 yards, with the longest of those going for 18 yards, and came away with a pass breakup. White was used almost exclusively at left cornerback, with 53 of his 58 snaps coming there, three in the slot and two as a strong safety. 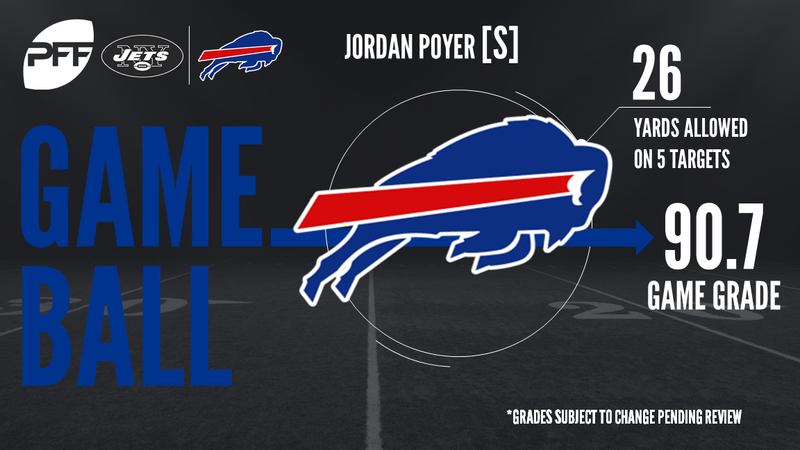 Poyer had an active day in coverage, coming away with an interception and a pass breakup from the five targets where he was in primary coverage. Giving up just 26 yards through the air, he was impressive at recognizing where the ball was going and meeting the receiver there. Outside of a 21-yard reception allowed to TE Will Tye, his other three receptions allowed went for a total of just five yards. In his first start at quarterback for the Jets, McCown was solid for much of the game when it came to taking what the defense was giving him, while things starting to unravel somewhat when the Jets were pushed to force the issue late in the game. Pressured on just seven of his 40 dropbacks, McCown went just 2-for-6 for 16 yards and two interceptions. That resulted in an passer rating of just 2.8, compared with a rating of 84.3 when kept clean. The Jets new addition at wide receiver has quickly asserted himself as Josh McCown’s favorite target, with the former Seattle Seahawk seeing the most passes thrown his way (9) of any Jets receiver on the day. Targeted underneath, Kearse averaged just 8.4 yards per catch, with a long of 18, but how often his quarterback looked for him given how short a time he has been on the roster was telling. The Jets picked up Ealy late in the offseason, but this move has already started paying dividends. Ealy recorded three total pressures – one hit and two hurries – on 19 pass-rushing snaps and also batted down a pass while he dominantly set the edge against the run. The rookie Adams had a mixed outing against the Bills as he struggled in run defense, but flashed ability in pass coverage. While he was beat for a long gain by Charles Clay early in the game, Adams made up for it by breaking up a pass and stopping Clay short of the sticks on a third down. Adams played 75 snaps, but only 19 came at safety, which led to some of his struggles against the run as he had to face Buffalo’s offensive linemen in the box.